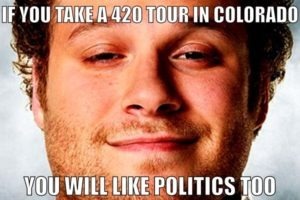 If you are coming to Denver, Colorado for the 420 friendly tips to have a vacation of a lifetime, then you must make it to Red Rocks Amphitheater. Red Rocks is a magical geological phenomenon and the only naturally occurring, acoustically perfect amphitheater in the world. If you love music, nature, and cannabis, then combine them all and have the best Red Rocks experience possible. Let’s face it – everyone ends up carpooling to Red Rocks to avoid traffic, parking, and all the other stuff that driving requires. Instead of telling your friend with the SUV that he has to be designated driver yet again, just get your friends together and rent a 420 friendly limo bus. It will pick you up in downtown Denver and you can hot box all the way from Denver to Red Rocks. Your private driver will even provide Pax 2 vaporizers, bowls, rolling papers, water and snacks on the bus. If that isn’t awesome enough, you can even have the “cannabus” take you to a weed dispensary before the show so you can stock up on Flo. If you’re going to Red Rocks, I strongly suggest smoking the sativa dominant hybrid Flo before you go. 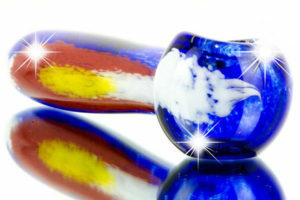 Flo is known for have a happy, uplifting and energetic effect, which is perfect to enhance an amazing adventure. 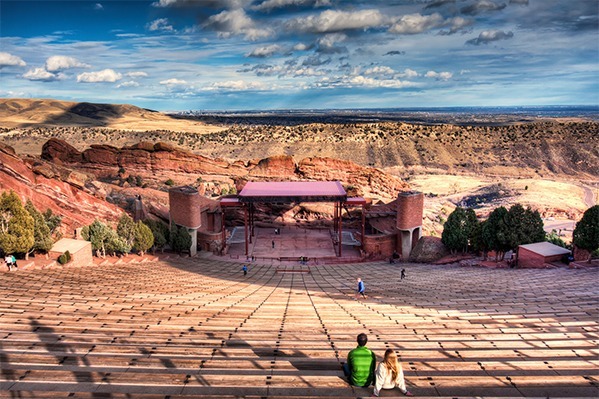 Going to Red Rocks with friends and seeing your favorite musicians while basking in the geological beauty is one of the ultimate Colorado experiences. 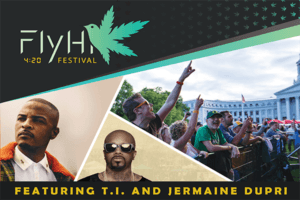 While you are not technically allowed to bring in marijuana and various other things to the Red Rocks venue, there is always a serious tail gating party in the multiple parking lots around the venue. While pretty much anything goes in the parking lots, if you want to be discrete about smoking herb, bring a vaporizer like a Pax 2. Portable, smoke-free, rechargeable dry herb vaporizers are made to look more like Apple products and thus they are very inconspicuous. Worst-case scenario people will wonder why you’re trying to smoke your iPhone. If you’re wondering how reusable water bottles could be related to marijuana, then you have never smoked weed in Colorado. So here’s the deal, most marijuana strains give you dry mouth, commonly known by cannabis connoisseurs all over the globe as “cotton mouth.” The very cliff notes explanation for cotton mouth is that when you smoke weed, the THC fakes out your salivary glands, so they don’t produce as much saliva, making you super thirsty. Basically, when you smoke weed anywhere, you get thirsty. However, when you smoke the finest legal marijuana in the world during your Colorado cannabis vacation, you are going to be very thirsty. Colorado is America’s highest desert, so needless to say it is incredibly dry and the state bird should be a Costco sized bottle of lotion. Bottom line, if you are smoking some of Denver’s dankest and you go to Red Rocks Denver’s, bring an empty, reusable water bottle like Nalgenes, Camelbaks or aluminum bottles. There are water fountains located near all the bathrooms, where you can fill them up. But, just like going to the airport, they will require the water bottles to be empty when you enter the venue. It should also be known that to get to the venue requires walking up a pretty serious incline, so you’ll want to drink the contents of your bottle on your way up. Tell us your 420 friendly tips on our social media channels. Play. Roll. Eat. Drink. Smoke! This class is perfect for anyone who wants to learn how to roll authentic sushi and joints. Play. Indulge. Enjoy. Party! The best of Colorado Craft Brews and Cannabis awaits you on this adventure. Learn. Immerse. Touch. Taste. Mix. Turn your love of cooking higher and learn how to make delicious cannabis-infused meals. Stay. Learn. Immerse. Enjoy. Explore. The quintessential vacation package, with a cannabis twist. Discover. Learn. Grow. Enjoy. Explore. Witness a true behind-the-scenes look at one of Colorado’s best cultivation facilities. 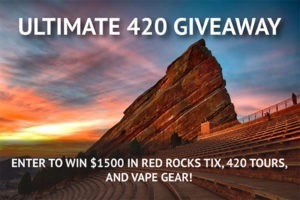 WIN $1500 in Red Rocks Tix, 420 Tours, and Vape Gear!